Nova Scotia announced letters of interest to 308 applicants in its latest draw for Labour Market Priorities Stream in Express Entry. The Mar 20 draw was the beginning to be explicitly focused at French speakers, with applicants requiring a Canadian Language Benchmark score of 7 or above in writing, reading, listening and speaking. Applicants were also expected to have at least of C.L.B 5 in English in all 04 disciplines. Those getting a letter of interest have only 30 days to provide a comprehensive application. Have chosen French as their primary official language and secured a Canadian Language Benchmark score of 7 or above in French in all language skills. Have English as a secondary official language with and secured a Canadian Language Benchmark score of 5 or above in English in all language skills. Hold an undergraduate academic degree OR have finished a program of 03 or above years at a college, university, technical or trade school, or different institute. Have provided a profile to the pool of Express Entry on or after Sept 20, 2018. Nova Scotia immigration began Labour Market Priorities in Aug 2018. Applicants should satisfy specific requirements along with settlement funds and work experience. Letters of interest will then be announced to those who are in the Pool of Express Entry. It was the 3rd draw held by the stream of Labour Market Priorities. 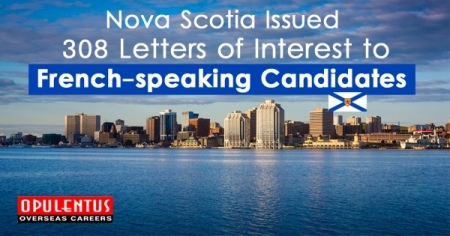 Nova Scotia announced letters of interest to 300 accountants and financial auditors on Jan 24, 2019. The draw noticed applicants with Express Entry CRS scores as less as 400 aimed for Nova Scotia immigration. Applicants expected to have a minimum of 05 years experience in the targeted professions, covered below NOC 1111. In the initial Labour Market Priorities draw, on Aug 8, 2018, the focused profession was NOC 4214: Assistants and Early Childhood Educators. Nova Scotia now runs 7 various streams for immigration.